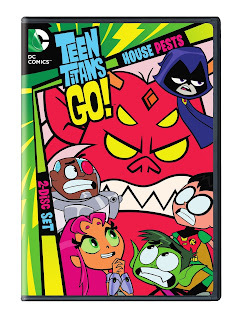 Today, August 18th, 2015., Warner Bros. Home Entertainment releases Teen Titans Go! House Pests Season 2 Part 2 to DVD. This unique and a bit odd show includes a whopping 26 episodes (over 4 hours) of the hit series quoted as the "#1 show for boys 6-11 on Cartoon Network and #2 show for Kids 6-11 on all of cable". The boys enjoyed season 1 so when I asked them if they'd be interested in the 2nd season, they said a definite “YES, we'd love another!”. The synopsis says "In Season 2 Part 1, the Teen Titans return with a whole new bevy of baddies, beverages and adventures! Partner up with Robin, Cyborg, Raven, Starfire and Beast Boy to defend Jump City against slimy monsters, tyrannical villains and of course, crime fighting induced hunger pains. Every vote counts when the Teen Titans hold team leader elections, Beast Boy dials up the “man-factor” with his new robotic limbs, while Raven races to save the cotton candy bushes from the Gumdrop Goblin." The boys were pumped when it arrived and wanted to watch it right away. We've literally watched this one again at least once a day since then. I have to say I think it is extremely strange and very off the wall. Then again I’m an adult and I think a lot of the new kid shows are kind of odd. Dane says he LOVES it and could watch it all day, everyday. Recommendation: I thought it was funny but definitely on the weird side, although again the boys loved it. As of now, I think they would be thoroughly disappointed if something happened to this DVD set. $20 for 26 episodes is a great price and with the boys so into it, I'd say it's worth the purchase. 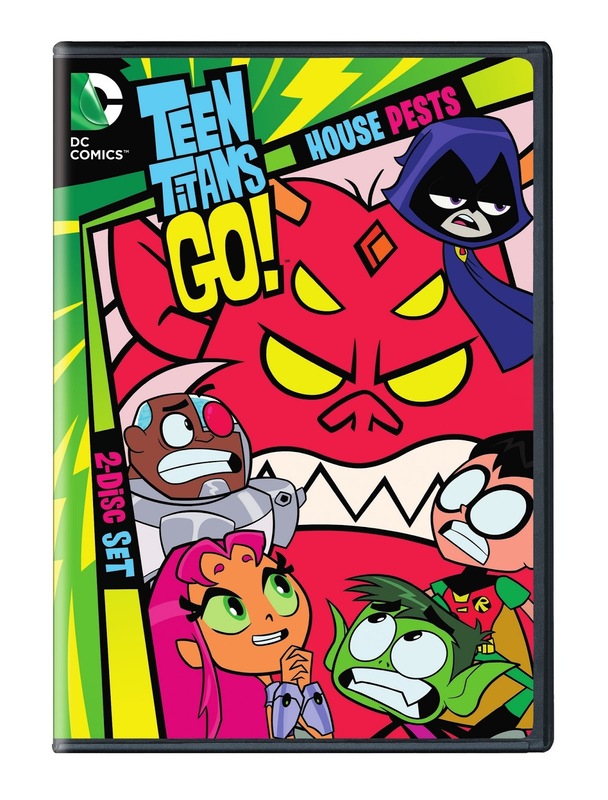 Giveaway: Warner Bros. Home Entertainment is going to give one of A Lucky Ladybug's lucky readers Teen Titans Go! House Pests Season 2 Part 2 1 DVD of their own! My kids have seen it, but they love disney descendants now. My Granddaughter Loves Teen Titans a lot, but her favorite show right now is The Thundermans on Nick. The Octonauts is my family's favorite but Teen Titans is a fun show. My son love teen titans, but he really likes adventure time. My kids love Teen Titans and Uncle Grandpa. Thank you! The grandkids like Sid the Science Kid and Dora the Explorer. I don't know if they have seen Teen Titans. All three of my kids are big fans of teen titans go and we watch it a lot. Paw Patrol is our favorite. We haven't seen Teen Titans before. My son loves The Regular Show, he also watches Teen Titans! Really not sure what my grandchild's favorites are, but I've hear of these guys. Teen Titans is my son's favorite show. He watches every episode. My grandkids love Dora the Explorer and they have not seen Teen Titans yet. My son loves Teen Titan, Uncle Grandpa, and Adventure Time.